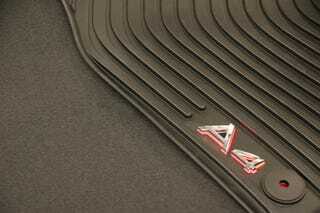 Why Wouldn't You Need LED-Illuminated Floor Mats In Your Audi? Audi made the most of its inaugural appearance at the SEMA custom car show by unveiling the world's first illuminated floor mats, made of an LED pad sandwiched underneath the vehicle logo. Next stop: rubber-ribbed iPads for your muddy Testonis. Audi said the mats, available as a dealer add-on, could be customized to different colors, light intensity and materials. The German luxury brand also showed off the first in-car wireless charging system for iPhones and other portable devices, and a iPhone app that can plug into an Audi's vehicle diagnostic center and analyze its carbon emissions. When it comes to modern German luxury sedans, there's apparently no such thing as too much technology.